Thanks so much for pouring your heart out on the page. It’s obvious that your healing is already in midstream and your candidness will inspire others to let out their inner rebels. Your tips are good ones especially not taking anyone seriously and breaking rules. You asked about me and my box; I’m almost always all the way out now, but it took years. In high school I pretty much flew under the radar as well. Then upon arriving on my college campus, I realized that no one knew who I was (including me), so I could craft the identity that I wanted. So I did. It partially worked, heck this was 1968, so almost all of us were trying to be free spirits. It was much latter into adulthood when I realized that I’d created a mask of sorts. So the final unveiling began on this trail back to my authentic self. I’m sure I’ll see you on that trail some day. I can identify with your story. I generally had only one or two friends as a kid and prided (deluded) myself on being a loner. Even today, I truly don’t have many friends, but it’s more by choice that thinking that no-one likes me. I know better — now. Hi Davina – kids can be little shits can’t they? They probably feel guilty now. I used to be a lot like you – I always used to think everyone was better than me. But you can change things. And with with each small step you feel more confident. And the more confident you feel – the more free you become. I’m putting those on post it notes for my computer monitor! Thank you for sharing! I like your site! That’s a really touching story. I went through something similar, and my mother tried to pay me to hang out with those girls and make friends. As if I could have. Have you considered where your belief system came from? As in … parents? That’s where I learned mine. 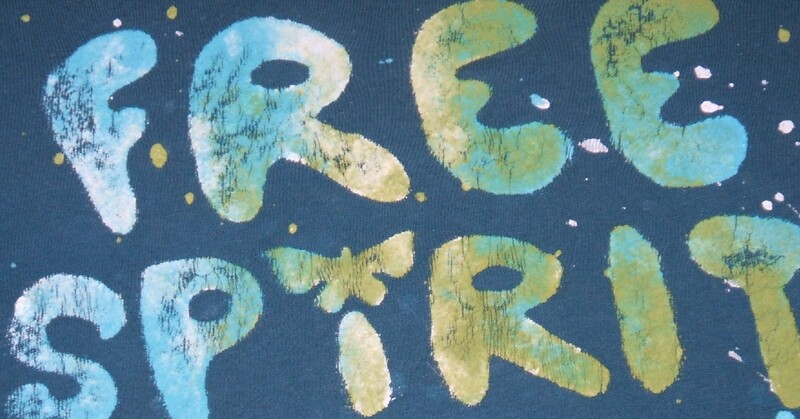 I don’t want to be a free spirit as you defined it, so I’m not sure how to answer. I think we’re all somewhat constrained by society’s conventions (which is often a good thing) and somewhat not. I don’t aim to get outside them, just to be me, wherever that puts me. Thanks for sharing your personal story. I feel your pain. I’m sure you know by now that most of us have emotional scars like that. Including those kids who hurt you. I myself struggled to get out of the box for years. The more I grow, the more I realize how I’ve been restraining myself. And the more I unleash, the more I realize how big, wide and strong my wings are, when I actually spread them all the way out! I’ve gotten quite a bit of myself out of the box, but it’s hard to tell sometimes — I keep discovering more pieces that I had hidden in the box, deeper than I thought possible. But it’s been very empowering experience. I hope, and I do believe, that you’ll get to experience it, too. Oops, just noticed that my link above is pointing to a very old, obsolete blog I have on WordPress.com — so here I am, linking correctly, to my current blog. Well, I think these girls WERE heartless and cruel. I am generally out of the box. I love myself. Although I consider myself as an introvert, I always had friends. But I was NEVER cruel to anyone who was “weak” and never will. I think that was great you crafted a new identity, and interesting that it became a mask of some sorts. We humans always seem to look for something to hold on to or lean on don’t we? Like you, I came more out of the box in college. Those were some good times. Hi Mike. Thank you for sharing. Yes, it sure is a choice. I read something somewhere about introverts and how it is not a weakness, it is a preference and a need. Some people just need more quiet time to nurture themselves, while others need personal contact. Hi Cath. Kids CAN be little shits! Yes, it feels good to swear. That is true, each small step forward feeds that confidence. Hi Kathy. Welcome to Loving Pulse and thank you for your enthusiastic comment. I’m glad you like MY rules 🙂 . Hi Mark. Welcome to you too and thanks! Hi Dot. Thank you for visiting Loving Pulse and for sharing your story. Your mother tried to pay you to hang out with those girls? Is this a metaphor? How did she try to influence you? I don’t know where my belief system came from. If you believe in reincarnation, (I do) it must surely have been a pattern that I was born with. It was noticeable at such a young age, (there was an incident at 5 years of age too), how could I have been influenced THAT much already by my life? Hi Ari. Nice to see you again. Thanks for the visit and for the sharing. Your reflections reminds me of those Matrioshka Dolls. You find more of yourself the farther you move out of the box. Hi Vered. Thank you for saying that! I guess it takes two to tango, but this was really a solo wasn’t it? Your statement, “I think the “strong” should use their strength to protect the “weak”, really landed. As I mentioned to Mike I’ve since learned that introverts have a tendency to be seen as weak by the majority of the population. But that is not correct. Only about 25% of the population are introverts and so there are just fewer numbers of us. And, it has nothing to do with strength of character or intelligence. It is a preference and necessary to express who we are in our own way. Hi Davina – Like Vered said, those girls were heartless and cruel, but worse than that, what they did, affected you for a long time by adding to an already “open wound”. Although my childhood was pretty uneventful as far as how I was treated ( I don’t remember being treated cruelly) , I do remember times in my early adult years when I felt “less than”. Through the years, and with the wisdom of age, I’ve come out of the box. I also have friendships that span decades. Your quote reminds me of one thing we have to remember. If we “wait” for an invitation it may never come. Sometimes we have to step out of our comfort zone and be the one who initiates “it”. I think I have still more work to do around this you know? It helped to a certain extent to take some responsibility for what happened, but there really is still a part of me that is angry with those girls. Obviously I can’t address them now 30 years later, but I’ll find a way to “clear this”. Hi Davina – Your answer reminded me of what I’ve read many times. I probably won’t get it worded exact, but it goes something like this. When we hold onto old hurts, we’re giving them “power” over us. So, in a sense, those girls still have power over you. This issue is also addressed in the book “A New Earth – Awakening to Your Life’s Purpose” by Eckhart Tolle, which is a great read. “Knowing” this event still bothers has you half way “there”, working through it, will complete the process. If this had happened to me, the first thing I would do is forgive those girls for their disrespectfulness, so that I could move forward. I’m also thinking (and hoping), if any of these girls (who are now grown women) remember the incident, met you today, they would apologize for having being so mean. I pray you find resolution so you can spread your wings and “fly”. I think that most kids have to try out being nasty to other people to see how it feels and know if they like it or not. Most of them realize they don’t and then stop, but unfortunately some of them never reach that stage. They’re still doing it when they’re adults. So yes, those kids were just doing what kids do, but it was only natural for you to feel upset. Being introverted, you had to keep a lot of it bottled in, which is why you still feel it today. As you say, it will help to ‘clear it’. I’ve talked a lot about clearing emotions on my blog but in a nutshell it helps to allow yourself to *feel* the emotion without getting into a dialog in your head about it. If you turn things over and over in your head, it only stokes it up more: “Those girls! How dare they?” There’s no point to that. They did what they did. You just need to really feel the pain and so release it. Davina, you are a free spirit! I think so, anyway, just from reading here. And, as for your ten actions – those are great ways to let the spirit be even more free. And in freeing our spirit, I think we breathe life into our bodies in new and exciting ways. We become alive to what we really desire. And that’s pretty cool if you ask me! Hi again Barbara. Thanks for taking the time for this comment. It is appreciated. Forgiveness! I’m surprised that I haven’t been able to forgive these girls and had not really entertained the idea. I thought I was better than that. And yes, I suppose I am holding on to something, although I can’t for the life of me figure out why I would hold onto pain. I recently bought this book of Eckhart’s but barely got through the first chapter. Sounds like it’s worth picking it up again. Hi Melissa. That’s a brilliant definition of a free spirit! Embracing yourself. Thanks. Hi Simon. I totally agree, “Stop caring what other people think of us!” I know what you mean about talking as if you are all sorted out. Taking our own advice isn’t as easy as giving it is it? Hi Lance. It’s hard to think about all these kids who could be, and are suffering in silence. And I know you are right; they are out there. Keeping it silent is probably part of the problem (I can attest to that). It festers and becomes so familiar that it’s harder to let go of. I like how you put it that by freeing our spirits we become alive to what we really desire. Two things helped – I have a very low need for “inclusion”. I am more content being a loner than trying to fit in. And yes, one of the girls apologized to me …years later … when I had forgotten most of what had happened ( I really think those girls in your case will be sorry too). 3. Apply logic and explain the behaviors – why did someone behave the way he/she did? And why did I behave the way I did? It is really important that I answer these questions as a free spirit. (this is where I love your free spirit actions) Without anger or malice. Against myself or the other person. (Let people make their mistakes and you follow your heart). Even after all this, getting out of the box takes more time, but I am on my way by the time I am at step 4. In your case, I strongly believe that the girls had no idea what they were doing. There was one bad seed and everyone else just mirrored her. They had no intention of hurting you. But you were hurt as anyone in this situation would have been. And you responded in a way that an emotionally mature child would do … you tried to deal with your emotions and not project them back on those girls in destructive ways. I think you should be proud of what you did … in some ways, your response was that of a free spirited soul …. And years later, as a result of this experience, you have a lot more to offer to the world than those girls ….So Thank you! “When you learn from something, it ceases to be a mistake” …. I truly believe in that …. so when I make a mistake, I try my best to learn from it 🙂 …and then move on, spread my wings and fly ! Thank you for leading me down this journey! Hi Davina, I love your list. At various points in life I experienced some of what you speak of, but I can’t claim I ever felt totally isolated. I’m not sure about children being heartless (as mentioned in the comments). I don’t think they’re really aware of the consequences of their actions. I think they just act out the model of the world they keep in their mind – and this is copied form what they see and hear, whether that’s friends, adults or TV. Seriously though, I love the list and I’d do well to use your wisdom to my own benefit. Hi Davina: I’m sorry that you had to go through that, but it’s often the people who are ostracized by the majority who go on to do something especial. I like your rule of living less in your head. That’s something I need to work on; I’ve always had a lot of “intellectual” success so I tend to rest on that more than I should. Hi Maya. Thank you for sharing. We can all learn from each other and so I appreciate your tips. While reading your notes it occured to me that this is no different than exercise regarding going in and out of the box. I’ve been reading some of Anthony Robbins’s work and he talks about neural pathways in the brain and their relation to emotional response. He goes into depth about making positive changes for ourselves in this area. The more we practice our emotional intelligence the stronger that nature becomes. Hi Dave. I understand what you are saying; it makes a lot of sense. And, there’s a but here…. I think it depends on the age of the children and the situation. In this case I believe a 12-yr-old would/should understand the “need” to fit in and be included, and would be able to sense what the result of their actions might be. A Barbara mentioned earlier, forgiveness is a good way to deal with this. As much as I’m resisting, I think THAT is where I need to go simply because I AM fighting it. I’m opening the door first on forgiving myself for believing them in the first place and then forgiving them is the next step. Hi Caroline. Welcome to Loving Pulse. It sounds like you are on an exciting journey! 🙂 I will come by and read all about it. Thanks. Hi, Davina: I, too, read you for the first time today…and was transported to my own hometown of 800, with the same nasty schoolyard kids. Ah, memories. Believed” is past tense, so whether you realize it or not, in your heart you are so over them. Maybe your mind just needs to catch up. Forgiveness goes a long way toward this. Maybe they were exactly what was needed to help you become you who are today, and if you can believe that, then you can thank them (on some level), and that’s when you’ll find you can just let them go flying gracefully into the ether… and you’ll be free of them. And then you won’t need a box! 🙂 At least, not most days. And because I still hide away in my own box from time to time (more than I like; okay, often) I’m going to use your list, because I really, REALLY like your phrasing. Hi Julie, and thanks so much for your comment! I’m happy to help 🙂 and perhaps, so are those girls??? First time reader here, Davina. I’ve seen your name around a bit so I thought it was time I stopped by. I really resonate with this article as I SEEM like I am very out of the box and free spirited, but in many ways I am still struggling to keep the box open long enough to leap out. And for most of my life I was very much in the box. I had a big facade about being an extroverted risk taker, but really I was just as scared and prone to please and cower against criticism as anyone else. I moved schools a lot when I was a kid, countries too. I chalked p somewhere between 12-15 school changes, most in primary school, and so I am VERY familiar with how revolting little girls can be. I think this is where my chameleon persona took root really. I had no stability in my life so I just learned that life was easier if I became whatever people wanted me to be. It’s taken a logn time to unlearn that. * Take the self and everyone else less seriously. * Stop trying to have everyone else conform to my rules. * Give other people permission to be themselves and make their own mistakes. * Let creativity speak and listen to it; practice what inspires you because that strengthens the spirit. * Get out of the head and follow the heart more; practice to learn the difference. * Take my place in the circle; recognize that I have gifts to share and just share them! Awesome quote. We need to realize and feel other people’s perspectives. They have just as much baggage and crap going on that we do need to by more compassionate. Sometimes I’m in the box, hating life then other times with a little work I’m out and free as an Elk. It takes effort to free ourselves of these self imposed shackles, but once we do we can fly. Hi Kelly. I’ve seen you around these parts too. Welcome! I’m making my rounds and will see you soon. Thanks for sharing your story. i had a similar set up in school, only i was kicked out “the club” (was i in a gang? )….any girl who didn’t conform or who acted too this or that was shunned…nobody would talk to whoever was kicked out until they were found crying in the school yard. kids are cruel. i’m a free spirit, but i do care what SOME people think, like my family. otherwise, i live in my own world in seems like. somedays (most day?) Im ‘afraid’ having a daughter…I just pray she can be unapologetically herself and make it through……….thank you for sharingbaring all of this. What a touching post! How sad too! It goes to show the unnecessary mental torture that we put ourselves through. Much of our pain is imagined rather than real. However, we continue to inflict pain on ourselves even though it is no longer happening right this moment. I think your first rule about not taking yourself or anyone to seriously is paramount not only to being a free spirit but having a happy life. FANTASTIC!!!! You go, girl. I never fit in as a child. Children are quite cruel to anyone who doesn’t fit their image of how to behave, and I always walked to the beat of my own drum. Only, my drum was also silenced because of very hurtful comments made during my early and teen years. Slowly, over the course of my adulthood, I realized what you have realized. Excellent list by the way. And eventually I found people who really like me for me. And I’m having a blast. From one free spirit to another, a big virtual hug of encouragement and support!!!! Hi MizFit. I believe if your daughter has you alongside her she will be guided in the right direction. I don’t have any children but I understand how important parental support is. Hi Evelyn. Unnecessary mental torture… ain’t it the truth! Thanks. Hi Suzie. Welcome and thank you for taking the time to stop by here. I am very happy to hear that little B is healthy and back into his groove. Terrific news. Hi Urban Panther. Thank you 🙂 Right back atcha! I know how cruel words slice and dice at the heart, too. I thought by becoming a tomboy, never fitting the norm, and speaking my mind bluntly that I could be happy walking a different path than those who looked with rolling eyes and down snooty noses. I was wrong. I still ended up giving them power by trying so hard to not be them. I found out later that there is conforming and trying hard not to conform, but that neither helps create a truly free spirit. I’ve found the wings that free the soul and mind, but I’ve yet to take flight fully. With a post like this one, your wings seem to fit you quite well! I can’t live in a box. I think outside of the box and I do things other teachers would be afraid to try. I don’t think we should fear what others might think if we try something new. We shouldn’t be afraid to stretch ourselves and step out of any perceived box or image that people may put us in. We should strive to be free spirits, in your sense of the word. Nice post! I can understand the pain you express in sharing this Davina. I was teased by a group of about 6 “cool boys” in high school. The teasing was about my looks and whilst the word ugly wasn’t used lots of other nasty things were said and done. The teasing hurt a lot at the time especially as it was relentless for about 2 years. It took me quite a few years to get over this. I bumped into 2 of the “perpetrators” in a night club when I was single and in my early 30s. I knew I had well and truly moved on as I was happy to see them and have a chat with them about our time at school in general. Funnily enough they said I looked fantastic and really meant it and well lets just say time and age had not been so kind to them. I suppose I wrote this little story mainly to encourage you Davina, that you can get over the hurt and get out of the box and be the free spirit you want to be. Forgiveness of others and of myself was the key for me. I have felt like I have been a late bloomer all my life and I used to see this as a drawback and now I see it as an asset. Perhaps your free spirit is a late bloomer too. I think the best is yet to come for you Davina. Well your experience at school just about sums up mine. Lovely writing today and I think it is so good to tell the story of our hurts and changes because then others can identify with the story and feel freer in their lives. Maybe it is the west coast weather but I wrote a personal release piece and posted it today. One thing that helped me get through all those edge of the circle moments, was that a very great writer (Ursula Le Quin) wrote many side articles about how to accomplish writing when a mother or when you are squeezing the time out of your schedule, said that by being on the edge of the circle was how she knew she was a writer. She was observing the behaviors and integrating them and she would recognize these as they came out in later characterizations in her books. She had to work through her own feelings but she needed to be an observer of human behaviors to make her characters real and believable. That concept gave me great hope of becoming a “great” writer in my lifetime because I dared to paint with words those integrations/observations. I am still working through the times of being left out, and I had a 30 something Mother come over to my house to tell me that our children could be friends, but she did not even want to be my acquaintance. It took me a good cry and 10 years + to finally write her as a character in a story and she turned out to be a talking duck! I found MY STROKE OF INSIGHT by Dr. Jill Bolte Taylor easier to read and understand than Ekhard Tolle – though I like his work too…just not as beautiful a writer as Taylor and she is so fluid to understand. A suggestion. So I just say – you must be going to be a GREAT WRITER…if the circle keeps you on the edge…So I will be watching and looking forward to your integrations and characters in your stories. Just think of each nip of pain as an inspiration for your writing and a gift. We all have to work everything through ourselves, so enjoy each opportunity…easier said than done, but well worth the practice. Hi Chase. Now I’m curious. What things do you do that other teachers would be afraid to try? Hi Leanne. Thank you for sharing your story, and for your kind words. You turned on a light for me in your sharing about meeting up with these guys later and having a nice chat with them. Thank you! Hi Robin. If you could go back and do it all again, what would you do differently? I’d have joined the school newspaper, the drama club and perhaps become a cheerleader. A free spirit. Funny, I have been thinking about this notion. Are we free because we say so? Or free because we think so? Or is freedom honestly loosing the obsession with the idea of constraint? Hi Harmony. Thanks! I like the last one… “losing the obsession with the idea of constraint”. Regarding the 40-something comments, I have to say a big thank you to Barbara Swafford and NBOTW, and to reader’s genuine curiosity and desire to share. youve been so mean to us but we still love you. in fact we are waiting for you. Our own youngest were so ready to be done with it and move on. I imagine things to be worse now in many ways, but due to some changes, at least there is more awareness of how hurtful bullies — and those girls were bullying you with their ostracism — can be. Your post reveals how strong the bonds we put upon ourselves are and the deep roots from which they spring. Thank you. I can only say congratulations to you Davina! You have let it out, most people suffer in silence and speaking out is a great step of releasing our troubled emotions. What’s more you have even woken up to the power within you, this is great! From now on, there is no stopping you girl. You now know where your power comes from and no matter what life throws at you, you will know how to come out stronger! You have uncovered the ‘Secret’ and let’s rejoice. Hi Betsy. Welcome, fellow camper! It is surprising how strong those bonds can be and how differently we can react to them. My mom was bullied by a boy in public school and what did she do? She beat him up! Guess I don’t take after her – ha, ha. Hi Rarestone. Welcome to you too! Thank you for those kind words of encouragement. I’ve just returned from your blog and the most recent post about $$$$ is an excellent idea! You would have been the type I’d have been attracted to if we’d gone to school together. I tended to be the type to pull people into my circle who seemed to need it, and I carried that through my college days. Being an only child, one would have thought that I’d have needed that affirmation from others, but I never did, thank goodness. But I had this empathy for other “only’s” and “lonely’s”. I’m glad you’ve moved beyond that; live life well. This was amazing! I mean, wow! And while I do think there’s blame to be laid at the feet of adolescents who let a social pecking order dictate their behavior, I’m blown away by your insight here. Part of handling passive-aggressive girl fights is about building each girl up individually, not neccessarily dismantling the social structure. And I love your free spirit actions; this is a list worth printing and staring at every morning. You’re absolutely correct in that the messages we wear on our bodies are nothing compared to the messages we tell ourselves in our heads and the actions we take. Hi Mitch. Welcome! Very funny 🙂 Well then, I believe there were some real lucky people who crossed your path in school. You did exactly what Vered mentioned earlier. You used your strength to support the “weak” (perhaps vulnerable would be a better word). Hi there Sara. I’m blown away by your analogy here about the messages we wear on our bodies and how they don’t necessarily compare to what we tell ourselves in our heads. Wow. If I had thought of that I would have put it in the post. Thanks! Hi, Davina. First time reader here; I followed your link from Tom Stine’s page. Great article/discussion. Just wanted to share an insight that I think might be apropos. There was a time when I hated my father, as probably many of us did. I grew out of it, as probably many of us did. He passed away suddenly 4 years ago Oct 1. In cleaning out the barn behind the house my brother found his diary from WWII. I quote; “Things have gone from bad to worse. Today I killed two German officers and a horse with my pistol [close range]. How can my wife ever love a murderer like me?” He didn’t need me to hate him. And it explained a lot of things. I have come to realize that whomever we love or hate or have any strong emotion towards DOES NOT EXIST! We never know the full story of anyone, including ourselves. Can anyone recite all the trauma that they experienced when they were two years old, or one? We’ve assumed the little history we know of everyone is all we need to form opinions and adopt a stance. So we actually create the people we interact with in our own minds. That is the only place they exist. This means that we are the only ones responsible for all our suffering. “Judge not lest you be judged” is so clear to me now. I am in the process of shedding biases and opinions. (Especially the ones about me). It is very hard. They have been my identity for so long. It will take me the rest of my life, and maybe beyond. Perhaps I state what is obvious to most of you, in which case I thank you for your indulgence, but for me, this has been a huge step in my understanding of the illusion we all manifest and what reality is not; perception. Hi Eric. Thank you for every word of this. What a powerful moment that must have been to have read your father’s letter. I like how you’ve painted that picture of how we “create the people we interact with in our own minds”. Sounds simple huh? But not so much perhaps? As a classic introvert, I struggle with that even today. Which is why your ten reminders, especially, sum up the attitude and actions I (and other readers too apparently–Yay, I’m not alone at all!) need to take in order to live more fully. I took a big step “into the circle” this weekend by making my blog public and inviting people into my world. Your post gave me an encouraging push in that direction, and for that I thank you. Hi Stubbygray. You are very welcome. Welcome to my blog. Receiving comments such as yours makes blogging even more worthwhile! Congratulations on the launch of your new blog. If you have any questions about blogging in general, here are some blogs that I hang out at regularly where you can learn a lot: Bloggingwithoutablog.com, Problogger.net, Cathlawson.com/blog and Virtualimpax.com. Have fun in the circle! I can truly relate to your experiences, and admire your humble recognition of certain youthful beliefs in need of redirection. I too have realized that the person I see in the mirror is all they’ll get (like it or not), but getting to know ME will become all that matters to those who matter. I have posted links to both your blog and your website on my facebook profile. Glad you popped in. I sure takes the pressure off when you live by that perspective. It’s not always easy though is it? Thanks for sharing the links. Generational unwiseness is what your pure spirit intuitively knowingly seeks, not of hopefulness, of pure knowingness of the pure light that is the core of your pure spirit within, of the same light you are from, that everyone is from. Sadly, the world embraces generational egotisms, a foe of forgetfulness of the pure spirit within us all, where most do not embrace the pure spirit as what is of most value in life beyond all the riches of the worldly falsehood empty egotisms. Turn towards the pure spirit you constantly are within, that has always been of the core of your BEing since born, not realizing all this time that there are not many who are of preferred priority knowingness certainty that their pure constant loving intuitive spirit is of oneness emotional honesty safety everyone subconsciously seeks within others at all times. Sadly, you suffered needless as a result of unwise generational lack yet in the world, the same lack of preferred priority of pure spiritedness asleep in ignorance of so many the world over, so much so, we leave defenseless children to suffer and die daily behind spiritual walls of death, with no voice of their own to cry out to us, if only we would take the blinders of societies status quo egotisms off to purely feel the pure spirit within unattended, just as the pure spirit of the child without is unattended, a direct link of undeniable unwavering unchanging TRUTH constantly there all around us.